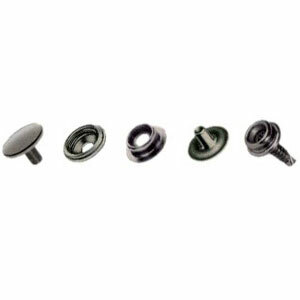 DOT® Durable is the fastener to use when superior snap action and holding strength are required. With a reputation of being the best performing snap fasteners of their type for industrial applications, DOT Durable fasteners’ heavy-duty construction assures a firm grip that will remain secure through years of use. DOT Durable sockets are constructed to narrow tolerances that ensure consistent snap action snap after snap. The design of the socket including its floating ring is superior to other socket types in performing on heavy-duty applications. A unique process in the fabrication of the DOT eyelets/posts ensures that DOT Durable fasteners penetrate even the most rugged materials without the need for a pre-punched hole. Various eyelet/post lengths ensure adaptability to a wide range of material thicknesses, and because it is self-piercing, no pre-punching is needed. 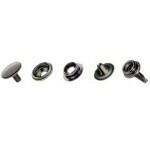 Available in a variety of eyelet/post lengths and in a variety of Caps, Sockets, Studs, and Screw Studs. Conforms to US Government MIL-10884 specifications, MS27980 Style 2.